PSC Teacher Training 10-week Intensive June-August! Pilates Sports Center Teacher Training Intensive at Pilates Studio City Annex with Master Trainers and Pilates Studio City beloved Instructors Mike Felbinger and Sarah Skaer. JUNE 7, 2013- AUGUST 30. Call for more info (818) 293-7487! Yamuna Body Rolling: Foot Fitness Workshop! Register for the Yamuna Rolling Foot Fitness Workshop in advance and Save Money AND your FEET! Do you experience tightness in your neck and upper back regions? Have you been told you have shoulder impingement, a frozen shoulder, or a rotator cuff tear? Do you have Carpal Tunnel Syndrome, or numbness/tingling down your arm/hand? Learn How Yamuna Body Rolling Can Help! Tips for Tired and Achy Feet! 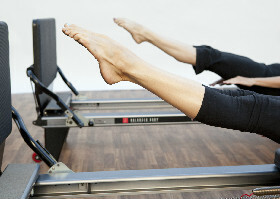 Learn how to get an Intermediate/Advanced cardio workout on the Pilates Reformer. Yamuna Body Rolling™ is a revolutionary approach to health and fitness using balls designed exclusively for this practice. It allows you to work specific muscles in detail, to create suppleness in tight areas and optimize range of motion. Yamuna Body Rolling™ reeducates muscles and stimulates them, creating positive, permanent changes in the body. 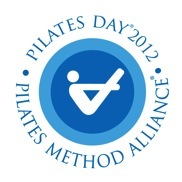 Pilates Day Mat Class in the Park! Join us Saturday May 5th for Pilates in the Park!